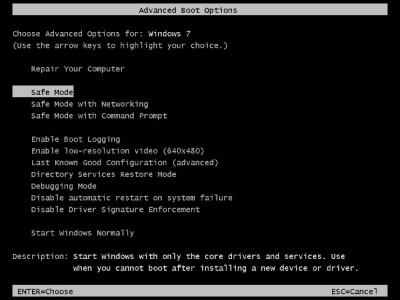 Windows 7 has several startup modes, called "Advanced Boot Options" that can help when troubleshooting the system. For example, the Safe Mode option lets you start the operating system in a limited state with only basic configuration settings and basic default device drivers. Other options start Windows with features intended for use by repair technicians or system administrators. To access these alternate startup modes, you need to press the [F8] key while the computer is starting up, immediately after the BIOS startup messages, and before the Windows logo appears. It's a mater of timming, (I actually just keep tapping the [F8] key while the computer is starting until the Advanced Boot Options screen appears). The Advanced Boot Options menu will display as shown above. Use the up or down arrow keys to highlight the selection of your choice, and then press the [Enter] key. Safe Mode bypasses most startup configuration files, including most of the registry. It starts windows without most of the drivers. It loads only generic mouse and keyboard drivers and the default VGA driver (Vga.sys) which uses 640 x 480 resolution in 16 colors. Safe mode lets you work with "bare bones" Windows. You have access to your drives, so you can copy or delete files. You can use System Restore to take your computer back to a restore point where it worked. You can use the Registry Editor to inspect or edit the Registry. Or you can use Device Manager to roll back a device driver that may be causing the problem. Safe Mode with Networking is the same as Safe Mode, except it loads network drivers and network services that allow you to access the local network or the Internet to get help or download files. Safe Mode with Command Prompt Starts Windows in safe mode with a command prompt window instead of the usual graphical Windows interface. This allows a repair technician or system administrator to run DOS commands to troubleshoot and repair the system. You can, for example, type C:\Windows\System32\rstrui.exe to start System Restore from a command prompt window. Enable Boot Logging mode causes Windows to attempt to start normally, but to log its startup activity in a file named ntbootlog.txt stored in the %SYSTEMROOT% directory (normally C:\Windows). You can then reboot to Safe Mode and open the log file in Windows Notepad or DOS Edit and search for a line that contains the word "failure". If Windows freezes before completing startup, the last line in ntbootlog.txt might provide a clue as to the cause of the problem. You may find that one or more steps fail during the startup process. Don't assume those are the cause of your current problem. Those steps may have been failing all along and you didn't know it. Enable low-resolution video mode starts Windows using your current video driver with low resolution and low refresh rate settings. You can use this mode to reset your display settings or to troubleshoot video display problems.